I couldn't contain my excitement and gave it all away in the title - but yes, we have finally bought a kitchen! A whole year without one and it's about freaking time - right? I have a backlog of blog posts I've been trying to get through, but to this current date (20th February) we are still very much without a kitchen and have literally only just purchased one! So let's start at the beginning. March 2016 (11 months ago!!) marked the month we dismantled the old kitchen, gave up plates, cutlery and home cooked foods, replacing them with ready meals and disposable equivalents. Since then, we've knocked down walls, installed a French door, a roof window, laid underfloor heating, tiled, re-done the electrics, plumbing, installed an extractor fan, repaired brickwork, fitted a log burner, I could go on. At this point, we've almost done it all. Short of finishing the flooring off, repairing some rotten joists, a bit more plastering and some painting - we're basically there! THANK YE GODS. Over Christmas we took a bit of a DIY break, saved some more cash and prayed desperately for some January sales to enable us to finally buy a kitchen. 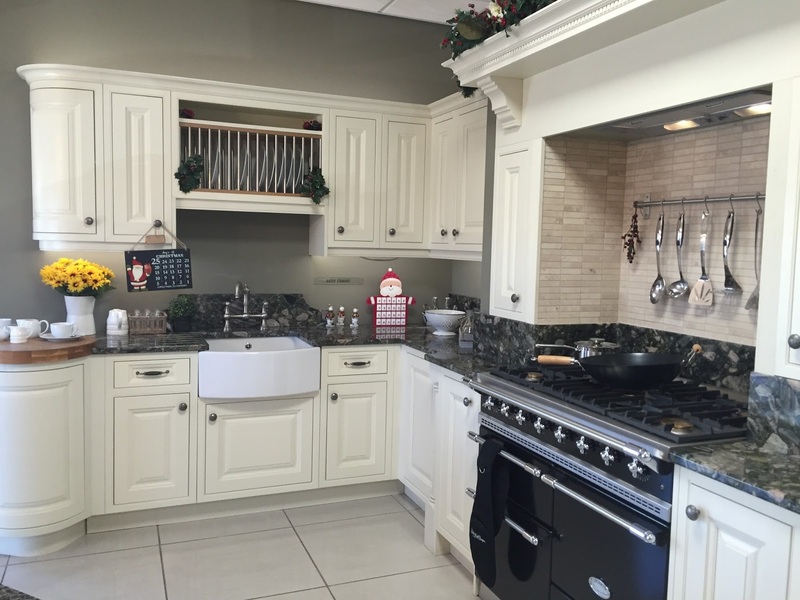 Throughout our entire kitchen renovations, we've always had a kitchen design and layout in place. We obviously needed it for the plumbing and placing the electrics - you don't want to be placing worktop-level sockets where they'll be hidden by a 2m wide larder and the such. So we've always had a plan from the beginning, which was created on the hope of purchasing a particular kitchen I had had my eye on, when money would allow. Or more to the point - when DIY-Kitchens would finally have a bloomin' sale! Do they realise I waited all year for that?! 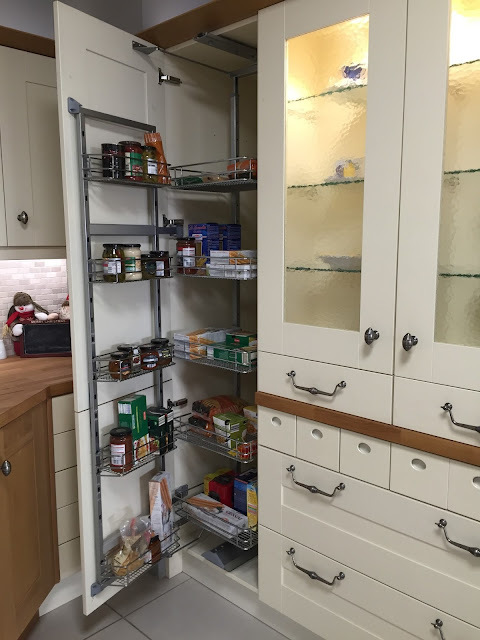 The kitchen in our last renovation was an off-the-shelf Wickes kitchen. It came in one colour only, few options for unit sizes and we basically picked it because it was cheap. Not the cheapest kitchen they did mind, but it was cheap non-the-less. The units alone only came to £350. For the entire kitchen! Mind you, we only had 3 of them and one wine rack. It screamed cheap. From the internal shelves that bowed overnight to the scuffing of the covered chipboard type material it was made from. It worked though. For a tiny cheap house, in a not-great area, it was perfect. This house however is much bigger in a great street and really needs something more than an off-the-shelf cheap as chips kitchen. It's also our long-term home, and we want something that's actually our choice this time - not determined solely by our wallets. (although don't get me wrong - that's still very much a deciding factor!) We definitely wanted something of a better quality and something that was nicer, to our taste. I knew I wanted something more luxurious this time, a bespoke kind of kitchen, but affordable on a tight budget. 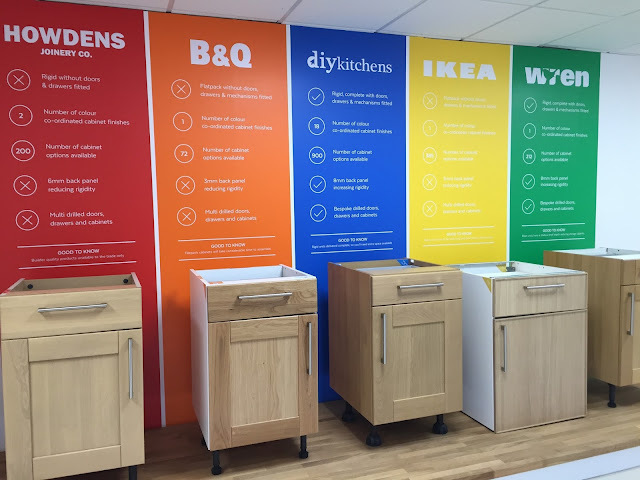 So, why DIY-Kitchens? We'd heard great things about DIY-Kitchens. 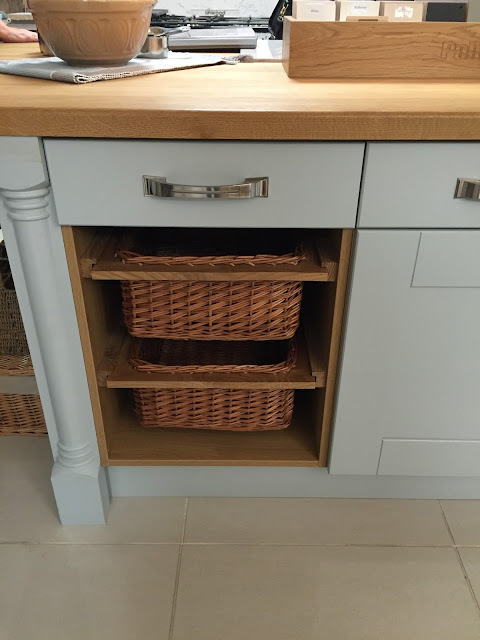 Not only are they adored on Instagram by other renovators, but their quality, large variety of styles, colours (this was the main winning factor for me - they even do bespoke colouring!!) 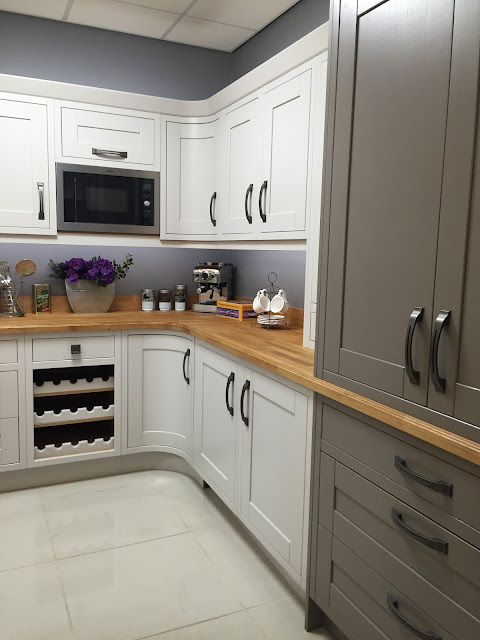 affordability, and of course, the fact they're a DIY kitchen, just had me at hello. 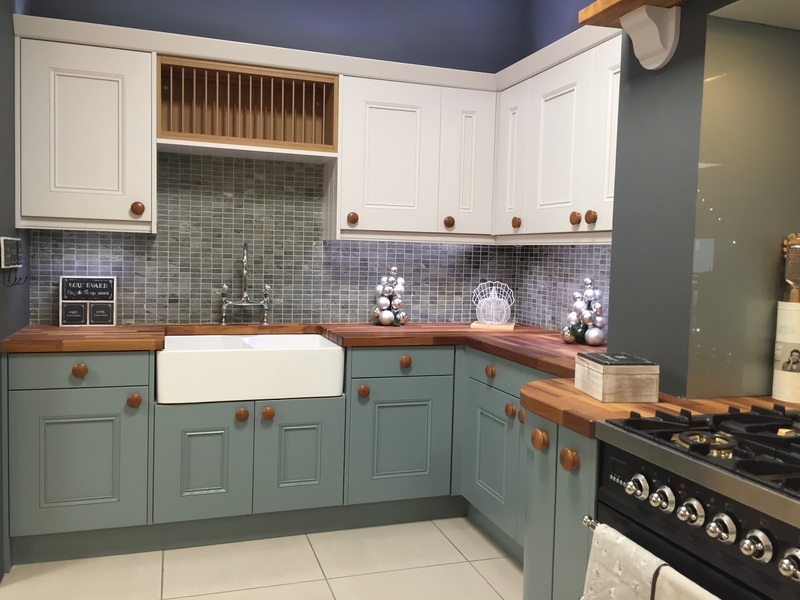 Unlike other companies where you have a designer help design your kitchen; DIY-Kitchens is all about doing it yourself, straight from the designing to the fitting. 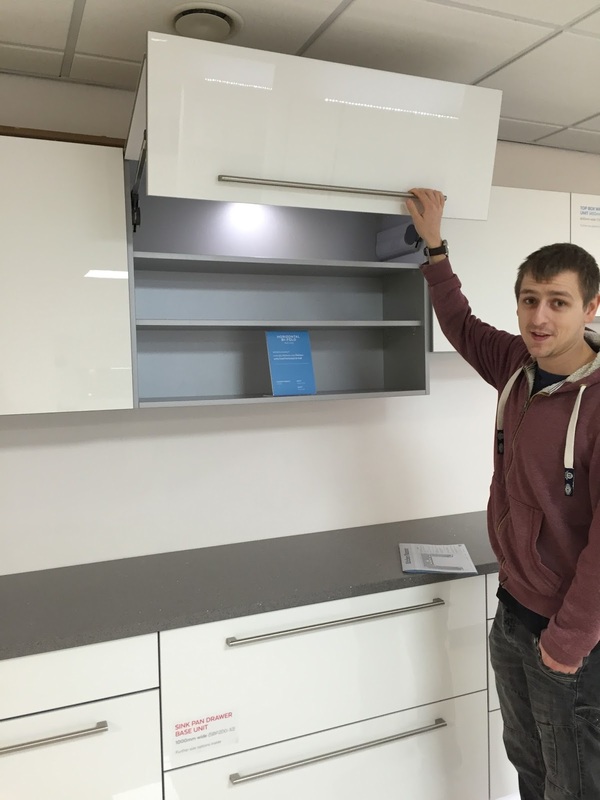 Although of course, you can hire an independent fitter if you want. The idea of having to liaise with a designer doesn't really appeal to me and I like to do everything on my own (bit of a control freak!) so it was absolutely perfect for us. A designer might be great for making sure your new kitchen works for you - making sure you're able to store your 20+ pots and pans for example - but for us, we just wanted it to look beautiful and work in our budget. Screw where the pots and pans go, I'll put them with the glassware if saves me £££ - I say that tongue in cheek, but actually it's kind-of true. Our old kitchen had just 3 units, remember! We also fitted the last kitchen ourselves, so we knew this was a DIY we were more than capable of too. 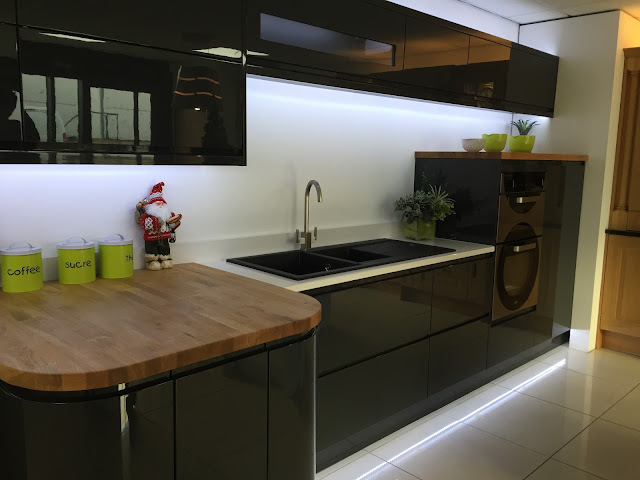 We'd visited the DIY-Kitchens showroom at the beginning of last year and I couldn't believe how great the kitchens looked. They felt really sturdy, appeared well built, and I actually felt looked much more expensive than they were. 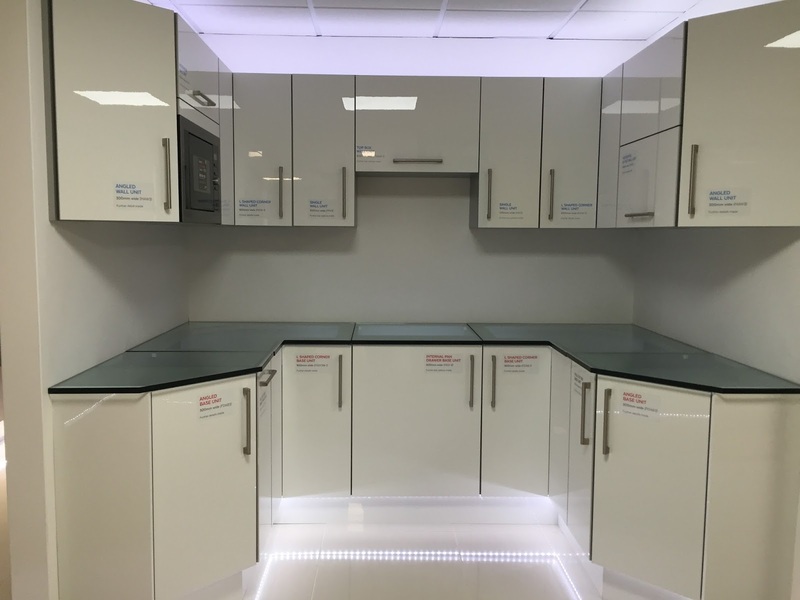 Unlike our last off-the-shelf kitchen with limited units and sizes - DIY kitchens offer absolutely everything. 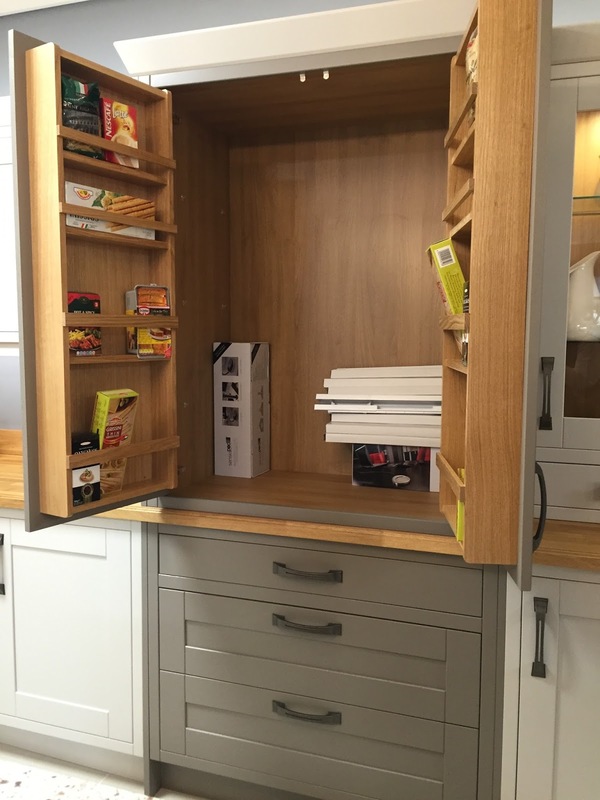 From larders to worktop dressers, wicker baskets, varying pan drawers - you can truly create the bespoke kitchen you're after, but in an off-the-shelf fashion and without the heavy sales-team approach. The prices are all entirely upfront, so you can see first hand where savings can be made. Less drawers was sadly the way to go in our case (damn those expensive drawers)! But, the digits are all at your fingertips! They offer all kinds of kitchens, from contemporary gloss ones to traditional wooden doors, shaker style, and classic too. 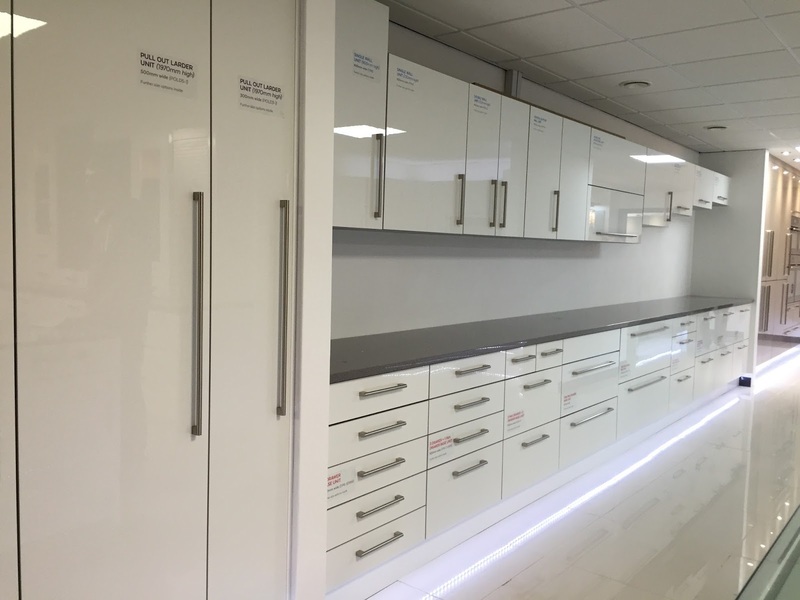 They pride themselves on having the best spec units (thicker than competitors and pre-made too!) and the biggest variety of colours. Their units also come in a large number of different sizes, there's even reduced-depth (and height!) ones for awkward spots, curved ones, pull-out bin ones, you name it. It's like a kitchen-y lego wonderland, where you can truly design whatever kitchen you desire. Visiting their showroom was also pretty great for inspiration too and if you're not great at measurements either - you can also see every different size unit they offer. Oh and not to mention the delicious free coffee and biscuits as well! We ended up going twice and staying for a good couple of hours each time, looking at units in great detail, deliberating between styles, even testing handles for the perfect grab-ability. 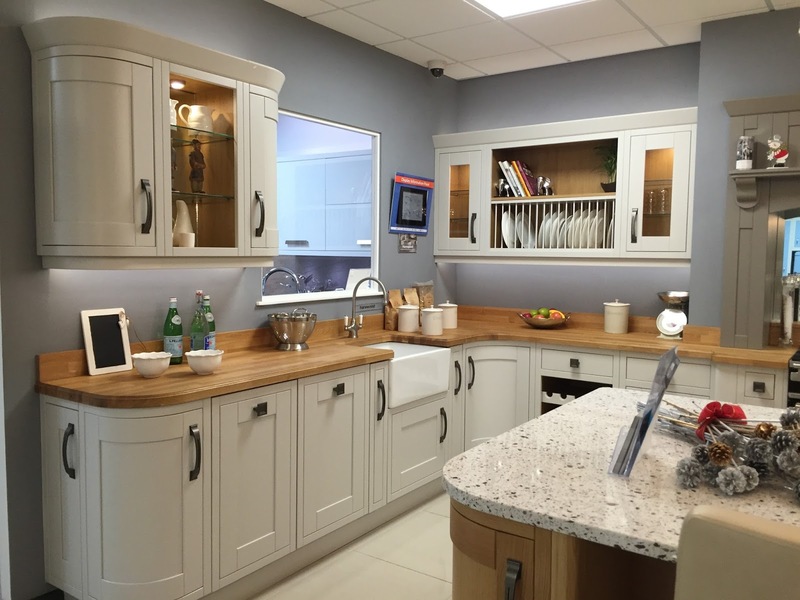 If you're thinking of using DIY kitchens and are close enough to visit their showroom in Yorkshire, I thoroughly recommend you go! We also took away some samples with us, so we could see how the colours looked inside our actual kitchen area and the lighting we have when we got home. The colour 'Lamp Room Grey' for example, looks very different under different lights. Designing your own kitchen may not be for everybody. You need good vision whilst being able to identify the practicality problems at the same time. It's certainly a bit of a challenge in some ways, but one I really enjoyed! 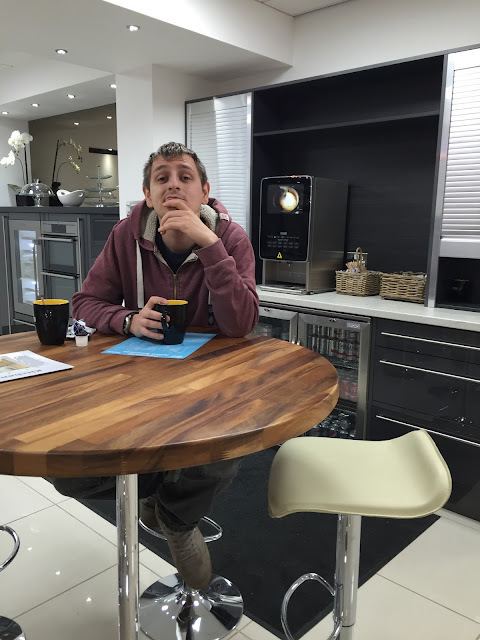 I'll do a more in-depth post on how we planned our kitchen etc and made it fit our budget. And also how we picked colours (thanks instachums for your help on that one!). But for now, all I have to say is - The kitchen countdown has begun! 4 weeks. And counting.